Home > Blog > History Blog > Aboard the "Landmark Express"
May is National Historic Preservation Month, a time to examine and celebrate historic places that tell our collective stories. Experience has demonstrated that historic preservation, when undertaken as part of a larger economic development program, contributes to community revitalization by strengthening a city, town or neighborhood’s identity and sense of place. Railroad depots have played a special role in the modern preservation movement. When private railroads began trimming their passenger services and closing stations in the 1960s, depot preservation became a rallying point for communities afraid of losing their built heritage. This was especially true for towns founded by the railroads where the depot had served as a central gathering spot to hear news, see friends, pick up a package or enjoy a meal. 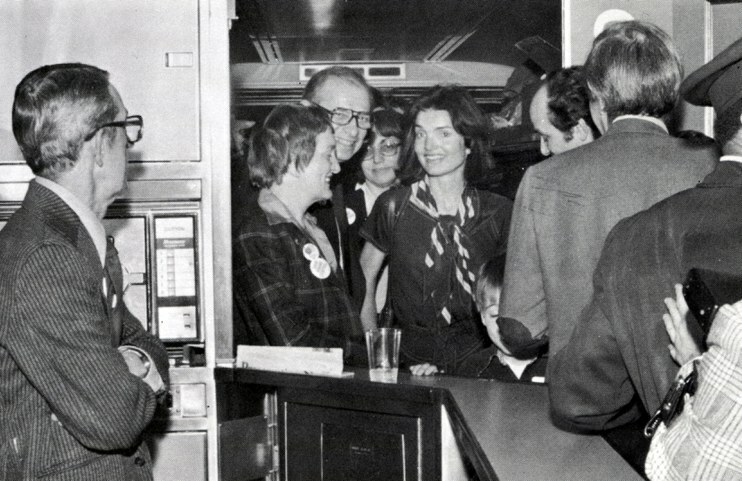 Jackie Kennedy Onassis and historic preservation advocates aboard a special Amtrak charter train - dubbed the "Landmark Express" - headed from New York to Washington in April, 1978. Today, more than one-third of all Amtrak-served stations are listed on the National Register of Historic Places. This honor indicates that a property is associated with significant events, activities and people in the nation’s history, or that it is noted for particular architectural or engineering achievements. Groups large and small work to preserve these buildings and share their stories with the public. Through the Great American Stations Project, Amtrak engages with communities interested in renovating and enhancing their stations. stock built exclusively for Amtrak. In 1968, the Pennsylvania and New York Central railroads, both in financial difficulties, merged to form Penn Central (PC). The company proposed to construct an office tower over Grand Central to take advantage of the prime real estate and raise needed revenue. With the destruction of Pennsylvania Station still fresh in people’s minds, there was public uproar at the plans to drastically alter the Beaux-Arts terminal. The LPC had listed the building as a historic landmark a few months earlier and rejected PC’s proposal. The railroad then sued the city, arguing that the landmark designation prevented it from gaining a reasonable economic return on the property—and therefore constituted an unlawful taking. The Municipal Arts Society (MAS) headed the movement to block the terminal’s destruction or significant alteration. Following a 1975 New York State Supreme Court ruling in favor of the railroad, MAS helped establish the Committee to Save Grand Central Station, whose most famous member undoubtedly was Jackie Kennedy Onassis, wife of former President John F. Kennedy. Her preservation background and celebrity created valuable publicity for the campaign and helped the group spread its message beyond New York. center with seating on either side. Penn Central Transportation Company v. New York City eventually worked its way to the United States Supreme Court in spring 1978. On Sunday, April 16, the day prior to the oral arguments before the Court, the MAS and Committee chartered a special Amtrak train—dubbed the “Landmark Express”—to carry preservationists and advocates to Washington for a press conference at Union Station (which was threatened with demolition only a few years later) and the Supreme Court argument the following day. Then-New York City Mayor Ed Koch bid the group farewell. At stops in Philadelphia, Wilmington and Baltimore, Committee members gave brief speeches and welcomed additional supporters. More than 400 people filled the eight cars, which included four Amfleet coaches and three cafes followed by a private car. The latter was the Pennsylvania, which only ten years earlier had carried the body of Robert F. Kennedy from New York to Washington for burial at Arlington National Cemetery. The atmosphere onboard was jovial, with two mimes, a pair of clowns and jugglers roaming the aisles while a classical trio and a banjo player provided musical accompaniment.1 McDonald’s provided hamburgers and French fries for the trip, and Committee members handed out T-shirts, balloons and buttons emblazoned with “Save Grand Central.” According to an article in Amtrak NEWS, Onassis made an effort to thank everyone on the train and stopped to talk and take pictures. threatened with demolition in the late 1970s. In Washington, Second Lady Joan Mondale, Senator Daniel Patrick Moynihan and a jazz band welcomed the group. At the press conference, Onassis stated, “If Grand Central goes, all of the landmarks in this country will go as well. If that happens, we’ll live in a world of steel and glass.”2 Following the formal remarks, attendees enjoyed a cake baked in the shape of Grand Central Terminal. The Supreme Court ruled in favor of New York City that summer, and Grand Central was saved from the wrecking ball. Metro-North Railroad took over operation of the facility in 1983 and began a multi-million dollar series of restorations that culminated in a rededication ceremony in 1998. 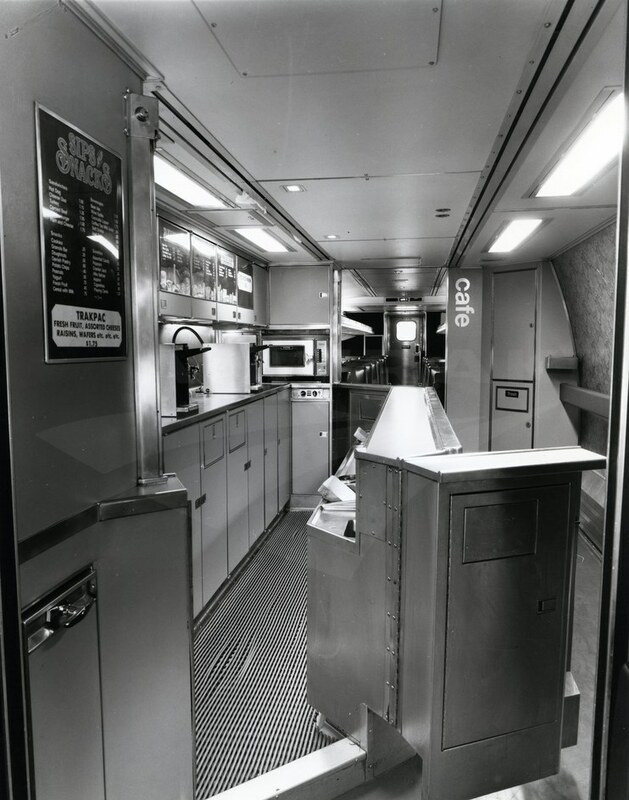 Amtrak’s Lake Shore Limited, Empire Service trains and Maple Leaf used the terminal until April, 1991, when all New York City services were consolidated at Penn Station. This was made possible by the completion of the Empire Connection, a 10 mile rail line up the West Side of Manhattan and over the Spuyten Duyvil Bridge onto the mainland. Today, Grand Central Terminal is not simply a transportation hub for commuter rail, the subway and local buses but also a popular destination for fine dining, shopping and special events. It also stands as a preservation success story for future generations. 1John Belle and Maxinne R. Leighton, Grand Central: Gateway to a Million Lives, (New York: W.W. Norton and Company, 2000).